While you no doubt understand the ins and outs of your local climate, when you travel you'll likely be exposed to many different environments and different kinds of weather. Unfortunately, misunderstanding a forecast or underestimating weather systems can be hazardous to your health and safety. To avoid falling ill while travelling in warm climates, be sure to eat well, rest often, hydrate frequently, use adequate sun protection and listen to your own body to help determine what it needs and when. Travelling in warmer climates can often make you feel less hungry than you would normally. If you find that you are eating less than normal, make sure that everything you eat still has nutritional value. Strive to eat at least five fruits and vegetables per day as well as rich whole grains and lean meats and/or seafood. If it is more appealing to you, try to have five small meals per day than three large meals. However, don't turn these small meals into snacks with little redeeming value. Try to take in at least 1500 calories per day, and more if you are physically active and will be burning calories due to your daily itineraries. There is always the temptation to rush around day and night to try to see everything on your travels. When you're in a warmer climate, such rushing about can affect your energy levels and overall health more than it might otherwise. Build small rest breaks into your daily plans, and always strive for at least eight hours of sleep per night. Not only will resting help you feel more refreshed and have more energy and enthusiasm for your travel plans, but taking a few time outs to enjoy everyday life in your new location is another form of sightseeing too. Warmer climates will make you sweat more frequently as your body tries to regulate its own temperature. Sweating more often means that you can dehydrate more quickly. To counteract this cycle, carry water with you at all times and strive to drink at least eight glasses per day. Limit your alcohol, tea, coffee and fizzy drink intake as these beverages can have diuretic effects and cause you to expel more water than you are replacing. Also look for snacks such as fruits and vegetables that will provide you with even more water. Stick to sealed, bottled water if tap water is unclean in your area, and do not accept drinks with ice cubes or food that may have been washed in tap water. If you find that your urine is becoming dark, drink more water until it becomes clear or light coloured which will indicate that you are well hydrated. 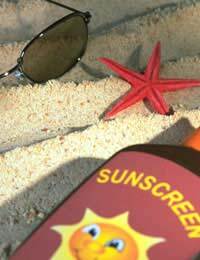 Warm climates very often have strong sun, so using adequate sun protection is imperative. To begin with, pay attention to the heat index in your area. A heat index is not the same as the outside temperature, but instead is a measure of what it will feel like outside in the shade. If you see a heat index of more than 33 degrees C then the weather may be hazardous to your health. Try to stay in cool areas and avoid direct sunlight. If you do go out into the sun, always use a sunscreen with an SPF (Sunburn Protection Factor) of between 5 and 50, and wear light coloured clothing and a hat if at all possible. Also use sunglasses with UV (UltraViolet) protection to protect your eyes. For best protection, apply sunscreen at least 30 minutes before going out into the sun and reapply often to exposed areas, particularly if you have been sweating or swimming. Use at least a handful to cover your body and don't forget 'hidden' areas like your ears and your lips. Warm weather will affect different women in different ways, so listening to your body is of the utmost importance in order to remain healthy. If you feel tired, light headed, dizzy, short of breath, or confused then get out of the heat immediately. Other telltale signs of heat illness can include white lips, red or white skin, hot, dry skin (with no accompanying sweat) and vomiting. If you do not feel better after resting in a cool area and re-hydrating, find a medical professional immediately. Also, do not be surprised if on different days, at different times or in different places the heat affects your body in different ways. Every body is unique and has unique rhythms, so listen to yours to make sure that you remain as healthy as possible as you travel.